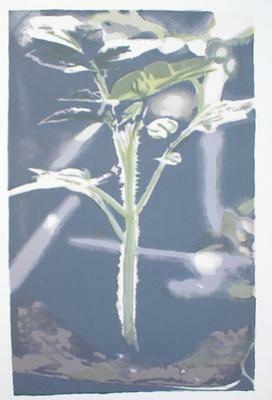 Original hand-drawn lithograph printed in colors from 12 stones, a fine, fresh impression of the only known state, the full sheet, printed on 250gr. Arches Velin paper, with large margins, signed and numbered in pencil by the artist, pulled in an edition of 100 examples (there were also 10 artist proofs and 10 proofs “hors commerce”) printed by the artist with the assistance of Rasmus Urwald, published by Edition Copenhagen and distributed in the United States by World House Editions, South Orange, in fine condition, unframed. Executed from 18 - 23 May 2004 in Copenhagen.